I will not take deposits until I can confirm she is pregnant and I will only take a few until they are born. A week or so after they are born I will take deposits for the remaining puppies. I will post when this happens. The next litters of puppies we will have will come from Sadie, Ruffles, and Annie will have puppies in the spring/summer. I will post when I’m taking deposits for these litters and how many deposits I’m taking. Sorry, I do not do waiting lists because they waste a lot of my time. Most people on the lists have already purchased a puppy or are no longer interested when I call. Please don’t ask for me to take a deposit early it will not happen. Please like our Facebook page listed below if you want to stay in contact and get notifications when I post. Like our Facebook page and it will send you a notification when we post something on our page. If you like posts when you receive a notification you are more likely to receive a notification every time I post. This way you can get up to date information with out having to check this website on a regular basis. 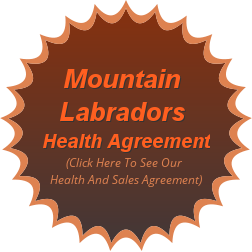 Please read our Mountain Labradors Health Agreement so you know what is expected of you when you purchase a puppy from us.